Garlic Gold – Organic Garlic Eggplants, zucchini and tomatoes - Incredible Five Star Recipe! August is official Ratatouille Season, didn’t you know? It’s easy to put together this baked version — all you need are fresh vegetables and a couple of our favorite varieties of Garlic Gold®! Herbs de Provence Nuggets add the flavor of the French countryside, giving this dish of eggplants, zucchini and tomatoes their classic taste. 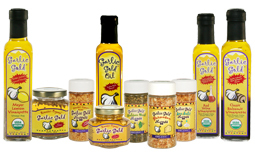 We sprinkle the nuggets all over each layer of vegetables and drizzle in some Garlic Gold® Oil while we’re at it. The vegetables come out perfectly seasoned, tender throughout, and lightly browned on top. Serve your ratatouille as a side dish alongside broiled fish for a light summer dinner. It’s the perfect way to celebrate summer’s bounty of beautiful vegetables! Slice all of the vegetables into 1/4-inch rounds. In a large bowl, toss the eggplant and zucchini slices with the salt. Let them sit for an hour, then rinse and drain the vegetables. Lay out the slices on a kitchen towel (it’s ok if they overlap a bit), then lay another towel on top and pat them dry. Preheat the oven to 350ºF and lightly oil a 9-inch square baking dish with Garlic Gold® Oil. Spread out the sliced onions in the bottom of the dish, then drizzle them with Garlic Gold® Oil and sprinkle on a layer of Herbs de Provence Nugges. 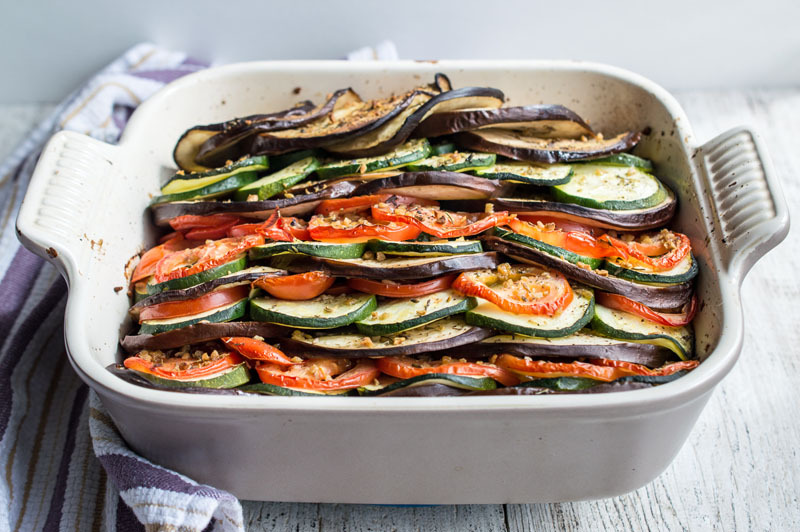 Layer the eggplant, zucchini, and tomatoes into the dish on top of the onions, sprinkling Herbs de Provence Nuggets and drizzling oil between each layer of vegetables. Cover the dish lightly with foil, then bake it for 30 minutes. Raise the oven temperature to 425ºF, remove the foil, and bake for 30 more minutes. Serve warm or at room temperature.